Tamara is a full Peruvian, Gunsmoke daughter. 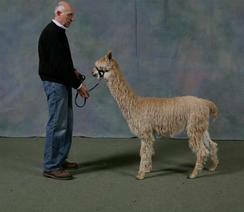 Her fleece displays lovely luster, lock and uniformity. It is also very fine and she she has excellent conformation. Gunsmoke is charcoal gray and the son of 4Peruvian Condor. He has produced many champions in an assortment of colors. 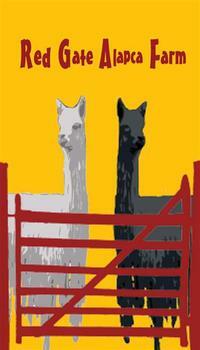 Tamara has produced two crias, a true black male named Duke who has been sold, and shipped to the UK to be a herdsire. 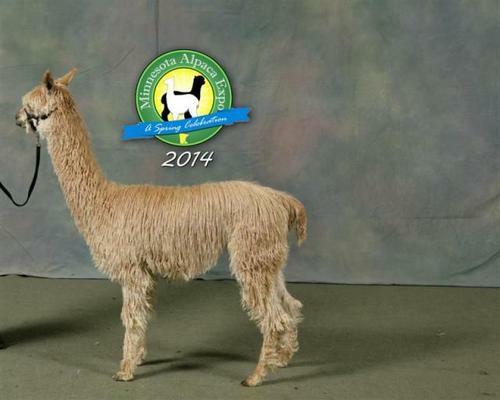 Her 2014 cria, light fawn male, will be on our show string this year. She is an excellent mother and will be a true asset to any farm. Tamara is being sold with a breeding to any Red Gate Alpaca Farm Herdsire. RGAF Peruvian Rocco is a solid full Peruvian male. His conformation is very correct with big bone size, with nice straight legs and top line. His fiber is fine with good luster and uniform lock structure. Rocco is also a calm easy to handle male.